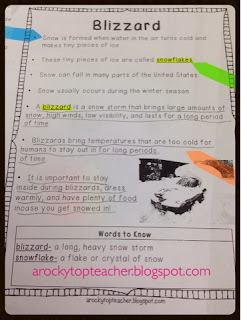 A Rocky Top Teacher: Breaking down text and a Giveaway! One of the biggest goals and focuses for my classroom this month(really, for the next 3 months) is to help my students feel confident and successful about reading and responding to text. So much of their yearly assessments requires them to read text that is on and above grade level---on their own. Yikes, I know! But, the purpose to get students reading and strengthening their comprehension goes so much deeper than that for me. As a teacher, I understand that students will be reading for the rest of their lives, and now, when they are in the lower elementary grades, we owe it to them to help prepare them for such a task. One of the best ways that I know to do this is to expose them to as much text as possible-both fiction and nonfiction. ALL. THE. TIME. Like most elementary teachers, I spend a great deal of time helping my students build a foundation for reading by teaching strategies during the first half of the school year. A majority of our reading lessons are centered around me modeling a strategy over and over and encouraging students to work in small groups to discuss and practice the strategies together. Whole Group, small group, whole group, small group, individual assessment. Repeat. Repeat. Repeat. But, the second half of the year brings a new approach. I end up spending a lot of time in small groups. I need to taylor instruction more individually because some students are soaring ahead, others are very behind, most are in the middle somewhere, and the needs are very different depending on what skills we are covering. This week, we started discussing how to "dissect" text. I have a classroom full of boys so we related dissecting things in science to dissecting our reading passages. Gross, I know...but they got it. To start, we took reading passages and just talked about how great readers break down their text to help them better understand what they are reading. 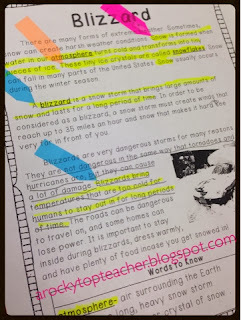 We used my Nonfiction Weather Reading Passages mini-unit to help us with this task. I modeled how I would dissect a text on the Elmo/Smartboard. We highlighted and flagged information until I thought the Smartboard was going to refuse to highlight and underline anything else. Later, we moved into small group time where I pulled out the highlighters and Post-It flags. (For some reason, you give a kid a Post-It note, and the world becomes a more exciting place. I have NO idea where they get this from. Certainly not me and my obvious obsession for all things Post-It.) The students learned about the importance of paying attention to word boxes and underlined words, how to flag answers in the text, and when to highlight/underline information that was important to the questions being asked of them on their own papers. Then, they had to answer the comprehension questions and cite their answers by giving specific paragraph and line numbers. It was hard work. I think I saw some sweat beaded on their brows(mine included) but they impressed me and asked when we were going to do it again. A lot, kiddos. We will be doing this a lot. It's going to be a long process, but I am really excited about how this is going to improve reading in our classroom. I'm curious as to if you have other exciting ways to model breaking down text like this! If you do...shoot me an email or leave a comment. I LOVE to hear from you. Now, if are you still with me at this point and just made it through that super long babble then BLESS YOU. I have a treat for you. 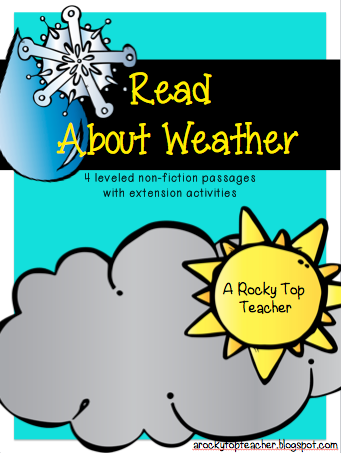 I really want to give away my Weather Nonfiction Reading Passage Mini-Pack. It comes with four passages about types of dangerous weather. 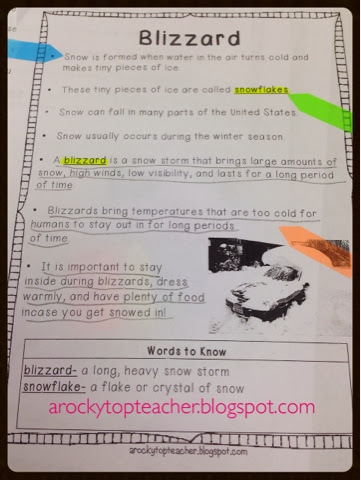 Each passage comes in two versions-below and on/above grade level as well as comprehension questions, graphic organizers, and a few science experiments to go with all of it. So enter below and I will pick a winner on Sunday. This packet looks perfect for the weather unit we are about to start! This is WONDERFUL! I'd love to win! Great post! 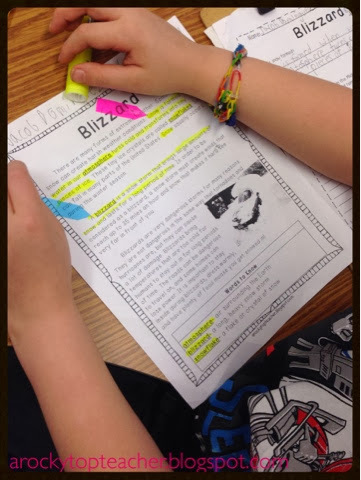 I have started breaking down text with my students, and having them cite evidence, and it is a slow process. It is interesting to see how other teachers are approaching reading. Thanks for the chance to win! Your packet looks great!